I have not posted for a couple of weeks due to being poorly. I live with Labyrinthitis/vertigo, mildly every day, but I picked up a cold and cough and the condition took me off to Viv's spinning world. Ugh, vile, horrid nasty condition it is. It seems to really kick off with cold infections or stress, neither of which is easy to avoid from time to time. Anyroadup, I now have a Specialist to go and waste a few hours of my precious time with. To be probably told that I have to 'live with it' and he/she will probably suggest a few exercises to try! Sorry, cynical grumpy old woman alert! My 'making' mojo had taken a short holiday break too whilst all of this has been going on. In the last few day I have managed to rouse the troops and get back to it, a little. Firstly, I found a lovely old booklet showing one how to make felt flower corsages..Well, I was going to go into business making these babies....this time next year I was going to be a millionaire! Ever the optimist! Well, it must have taken 4/5 hours to make just the one, so thats that idea out of the window. (Not literally). the other, an envelope dated 1966, sent to Japan and duly returned to sender. I had the wonderful task embellishing the envelope, which has the most exquisite markings and Japanese handwriting. Whilst wallowing in my misery, I have had two lovely surprises ... amy and I arranged a swop. As you may be aware I adore Amy's work and so it was with great pleasure I received this wonderful work. Amy thank you, I absolutely adore her...your part of the bargain will be sent soon. I also won this fantastic Orchid pendant handmade by jo of Tanglefrost. Thank you Jo, for your beautiful piece and for all the lovely, kind things you have written. Finally, we have all been agonising as to whether we should have another dog. Daisy is certainly lost without Rosie, but we cannot agree on what flavour to have. Many people have suggested getting another dog, not to replace Rosie but to kind of fill the huge void that is left. 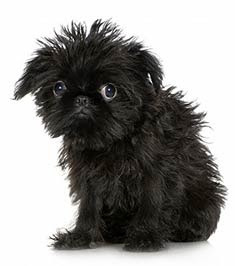 This baby is a Griffon Bruxellois. I wondered if any of you kind ladies out there have any advice with reference to this breed. The current husband and Holly want a Border Collie!!! I don't think we will ever agree. Just a short little post this week, as not much to report. The week has flown in a blur of work, backward and forwarding to work and then the usual stuff 'n' housework but it has all been much more pleasant to join the rat race of late because, as we all know.... Spring is coming, slowly but surely and I for one are so happy. For me, as I remember saying this time last year, it's like emerging from a long dark tunnel into the light. Thankful sigh! Changing the subject, we went to the flicks in the week and saw Avatar. Not only did we see Avatar but we saw it in 3D!!! Wow! Although, there was a lot of beasty and avatar/human fighting, it was so glorious and beautiful. Like the most colourful mixture of all the most exquisite things a mind could imagine. I did enjoy losing myself in such a glorious film for a couple of hours. and another tin. I didn't embellish the front of this little tin, as I adore the wording 'Victoria Tasteless Stamp Mounts'. and inside...another garden themed double trouble embroidered collage.